Volquartsen LB Pistols. Lightweight and V6. Next shipment will be the New Mk4 Model, pictures not yet available. Manufactured by Volquartsen Custom in the USA. Designed by, and exclusive to Stockade Products. 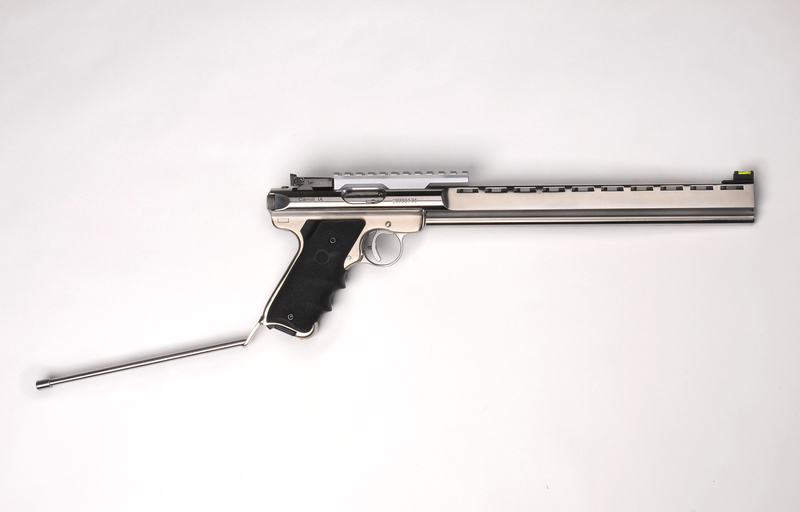 UK Section 1 Target Pistols .22lr Semi-Auto. With 10 round Magazines. Based on a Ruger MkIV design, with the competition proven 12" Volquartsen Carbon Fibre Barrel, featuring a specially designed muzzle brake. 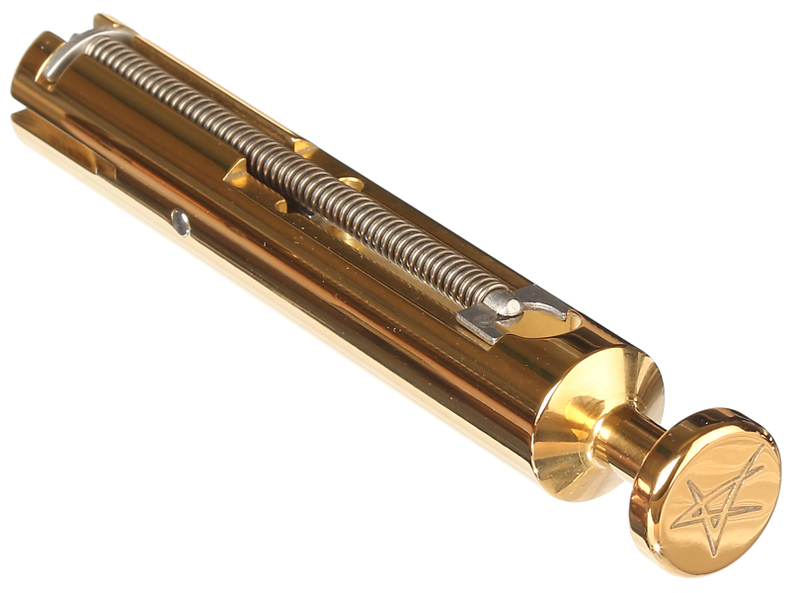 And this all combines to create the most accurate and balanced Long Barrel Pistol available today. First, we start by tuning the action using our own MKIV accurizing kit, as well as installing a pretravel adjustment screw to the trigger to achieve a crisp, clean 2.25 lb. trigger pull. Our Volquartsen Laminated Grips (Right hand only in a choice of colours.) 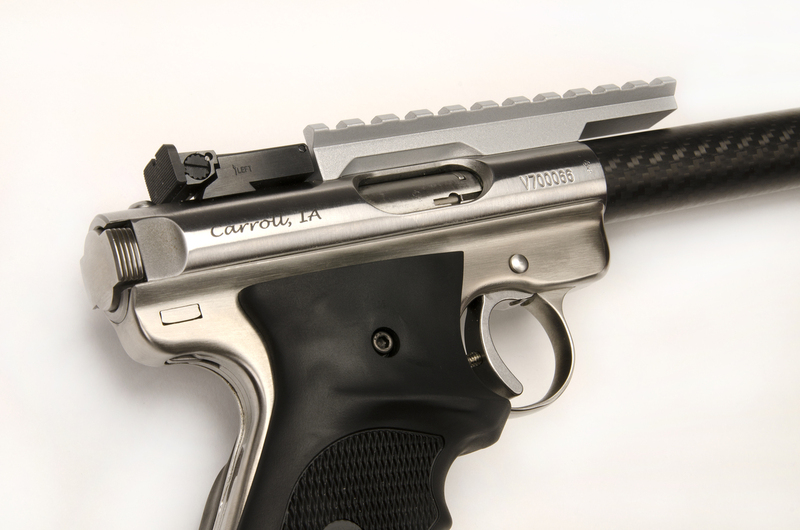 are standard on all of our Mark IV pistols, as well as the original Ruger grips supplied for holster use. 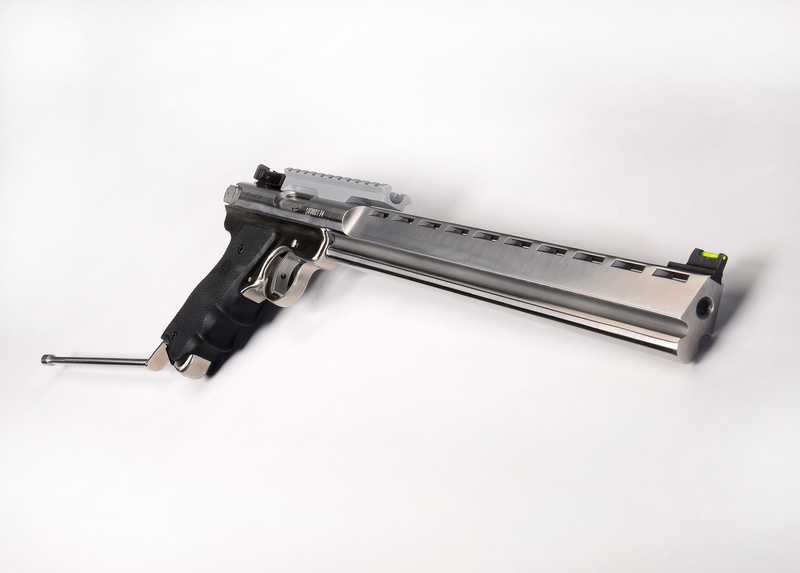 We use only stainless steel “match” digitally gauged blanks on all of our pistol models, and we use the same chamber and bore dimensions on each of our pistols models, as well. The chamber is hand cut using our own unique reamer. 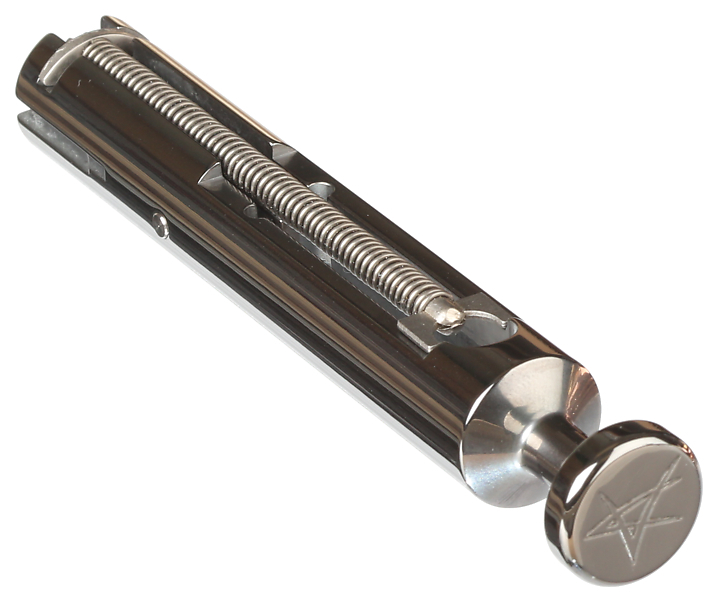 The feed ramp is also hand polished to ensure proper functioning. Each pistol comes standard with our TL Rear Adjustable Sight and a .125" wide front dovetail sight unless noted. 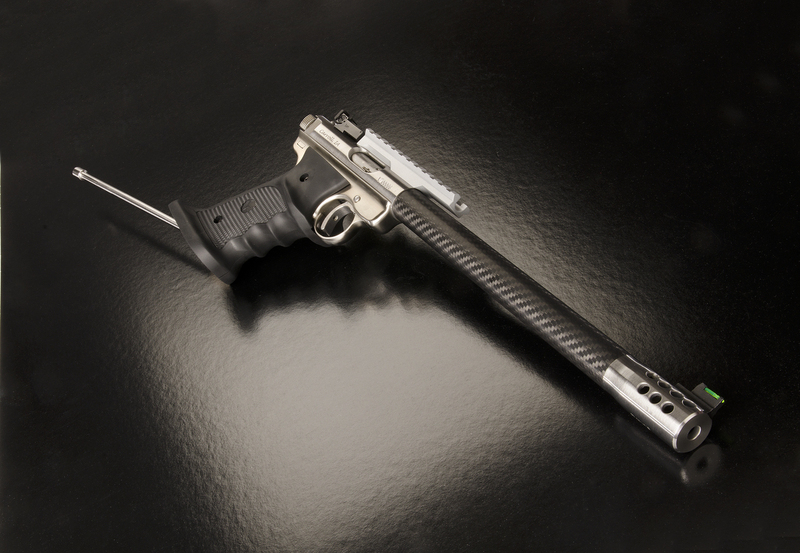 All pistols have a stainless finish, but a matte black finish is also available. It is fully tuned and 'STATE OF THE ART'. 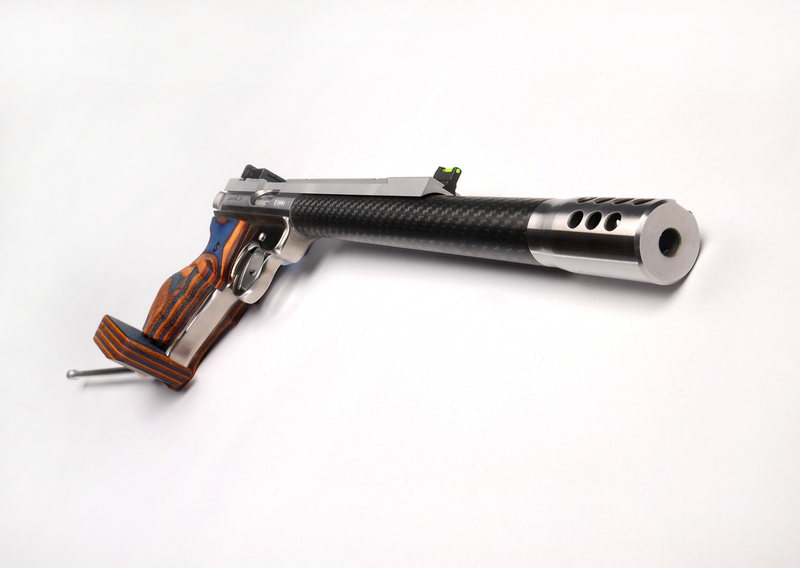 RH Volquartsen Laminated Target grips are included as standard, as well as the original Ruger grips for holster use. It is fully tuned and 'STATE OF THE ART'. 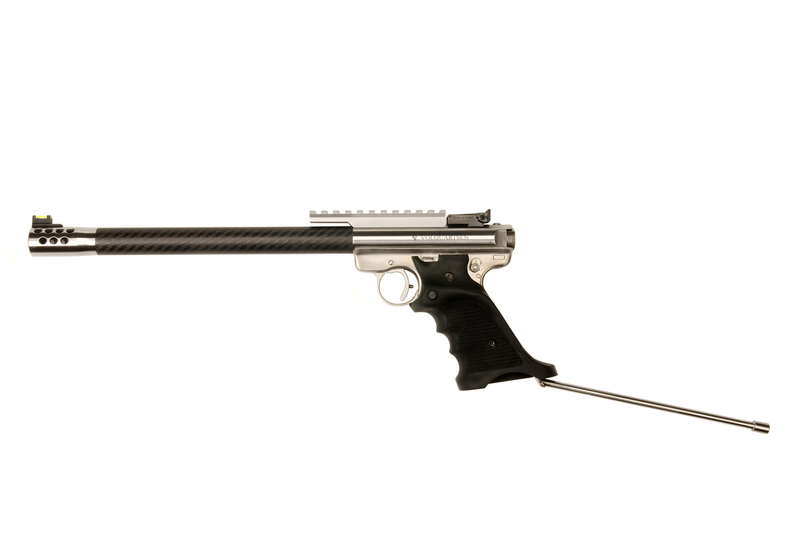 Perfectly balanced and weighing in at 1.425kg for the Lightweight Carbon Barrel Pistol. UK Section 1. 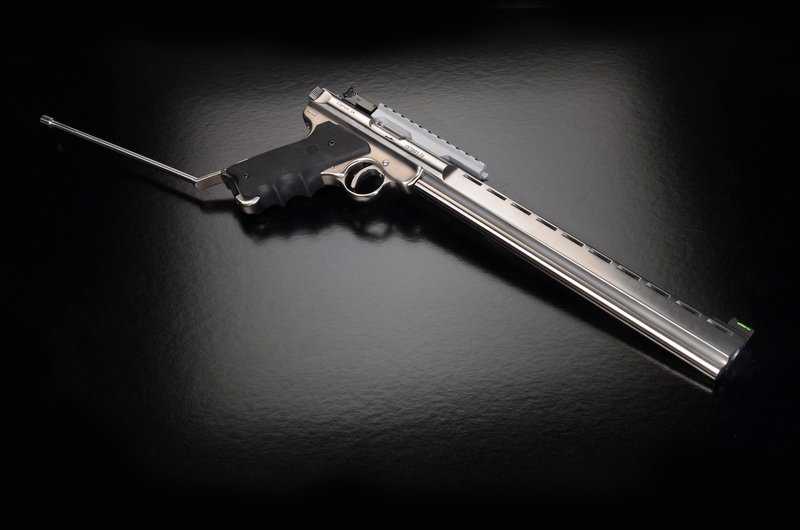 Long Barrel Pistol just got serious!!! The recipe for a customers Ultimate Target Pistol. 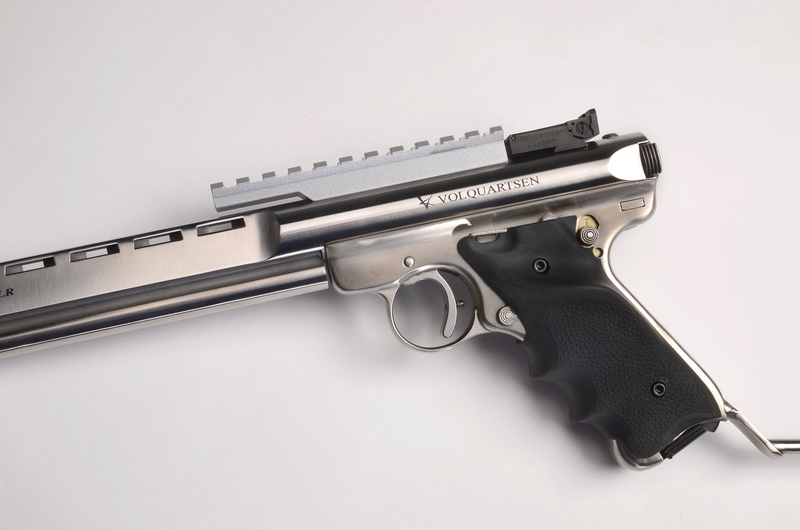 1.Start with one Volquartsen Lightweight LB Pistol fully tuned as standard. 2. And mix in a beautiful Volquartsen Competition Bolt. 3. Top with a Volquartsen Masters Sight Rib. 4. Add one Volquartsen Extended Safety. 5. Finish off with Rink Adjustable LH Target Grips. It features a 12" match, digitally-gauged barrel with a full length triangular-shaped underlug that sports a vented rib. 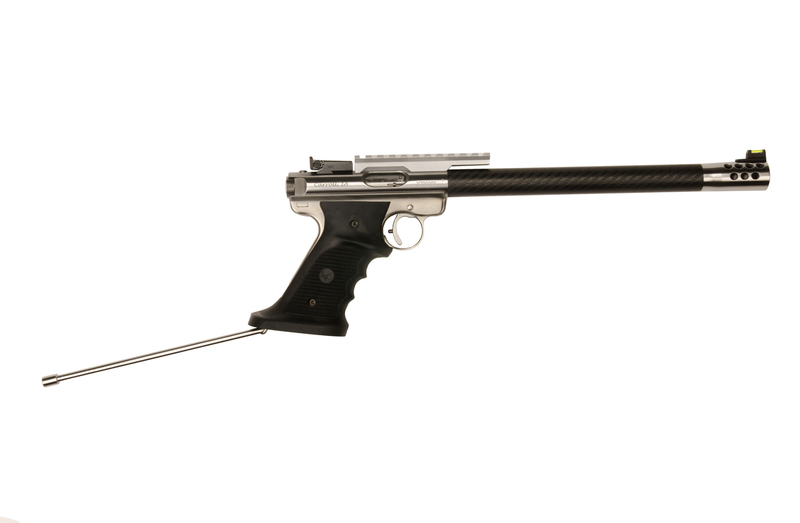 The Competition Bolt is sold as an exchange item for your Stainless Ruger Bolt. 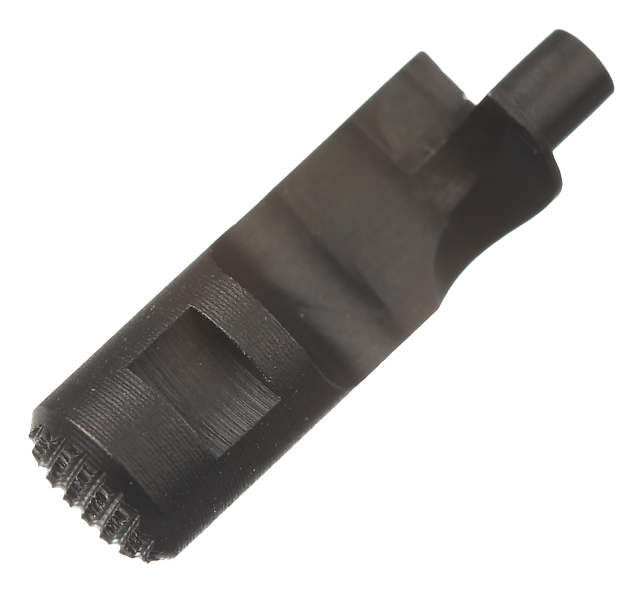 Are you a competitive shooter looking to eliminate stovepipes, failures to fire and improve the overall performance of your Ruger MKIII or MKIV pistol? The Competition Bolt is the answer! The Competition Bolt has an integral Extended Bolt Racker to allow for improved manual cycling of the bolt – no more pinched fingers! 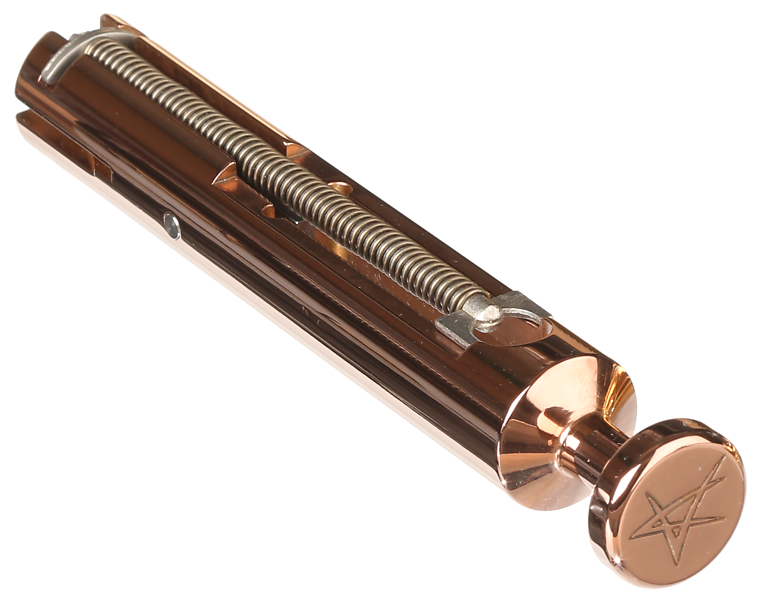 The Competition Bolt is case hardened and then treated with a high performance premium finish. The advantages offered by these finishes make it a must have for the competitive shooter expecting the very best in terms of function, reliability and performance. This finish is available in four colors: black, metallic silver, gold and rose gold. 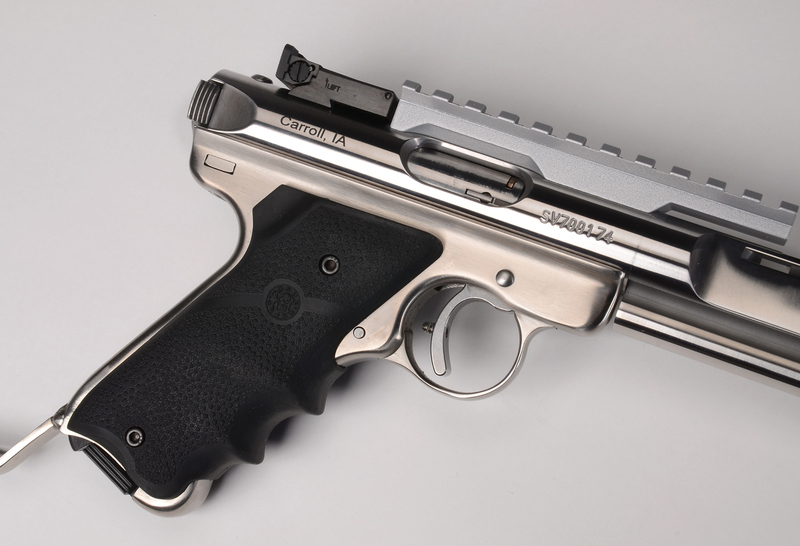 The Extended Safety provides the shooter improved access to the safety on the Ruger MKII, MKII 22/45, MKIII andMKIII 22/45 pistol. 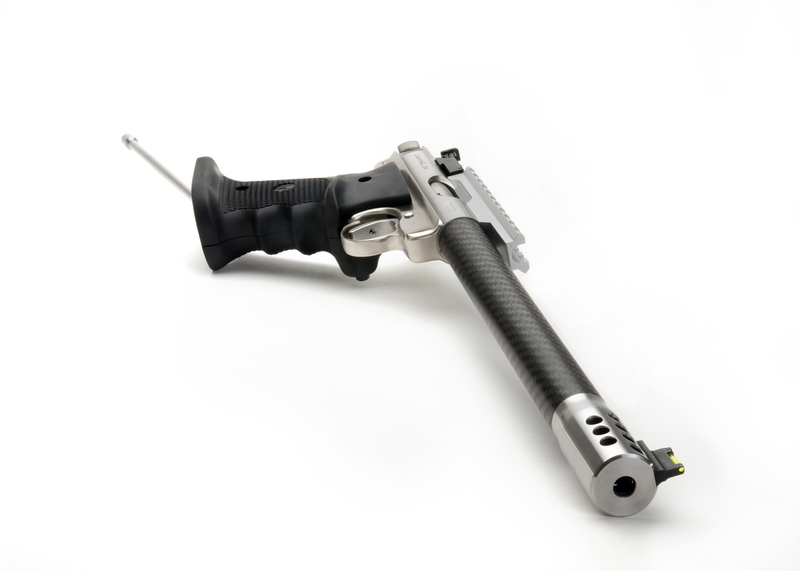 The Extended Safety is the perfect addition when being used with target grips. 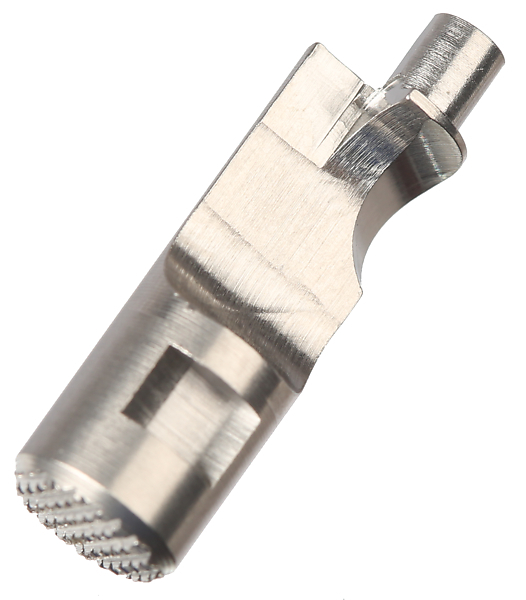 The contour is wireEDM precision cut from 17-4 stainless steel. The Extended Safety is .150" longer than the factory button. Comes complete with safety detent and spring. "I use one of these on my V6 in Competition from the holster with Hogue Ambidextrous Grips, and it enables fast and possitive operation of the safety. Certainly recommended." 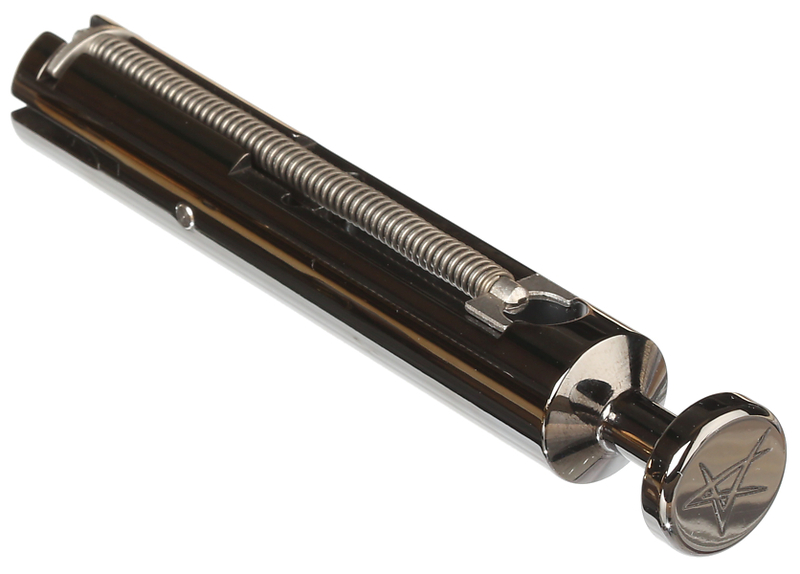 The MKIII Extended Magazine Release is an 1/8" longer than the factory release providing easier access. 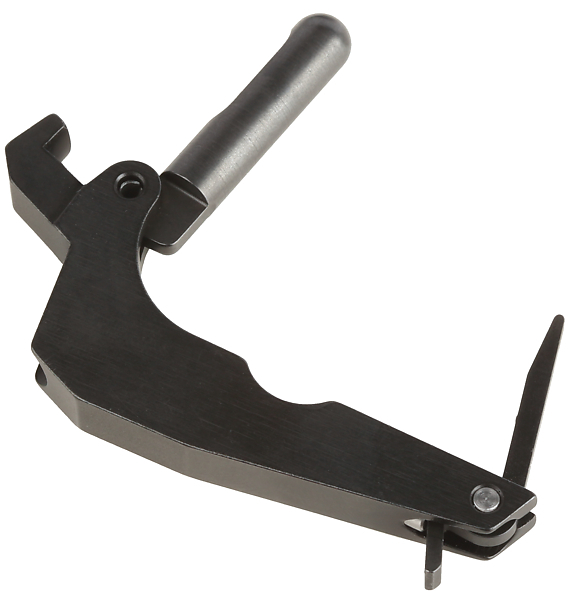 This release has also been modified to improve insertion of the factory magazines. 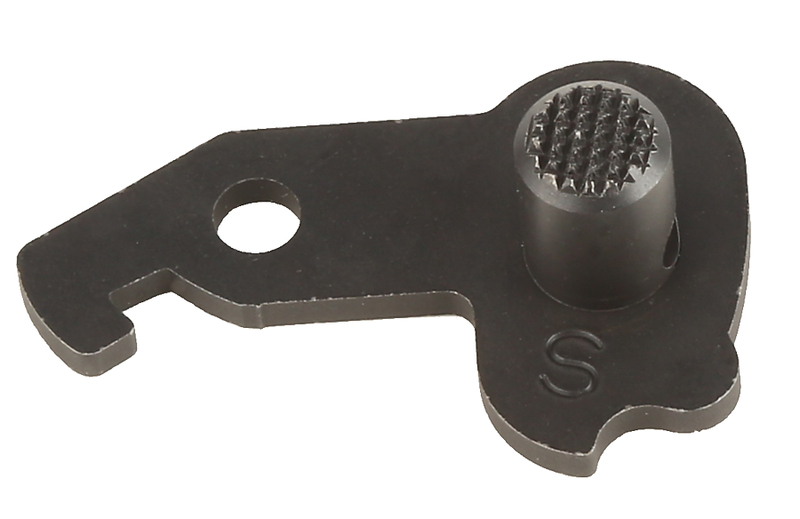 Complete mainspring assembly designed for the Ruger MKII or MKIII. 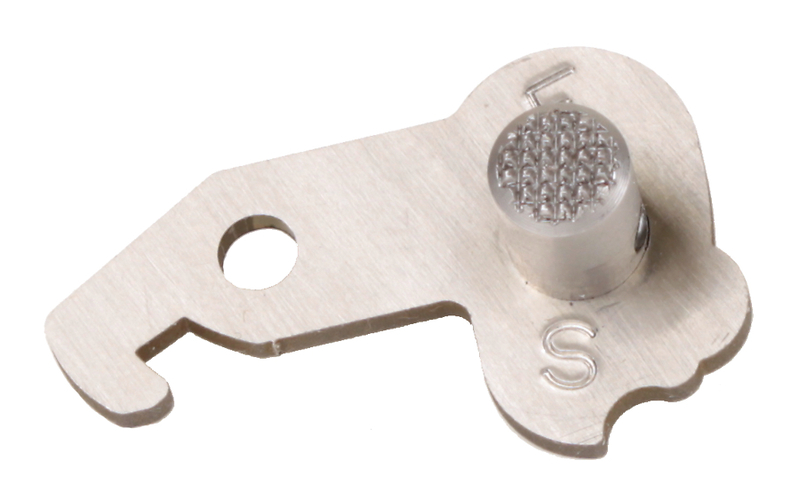 Mainspring components are wire EDM-cut andCNC-machined. 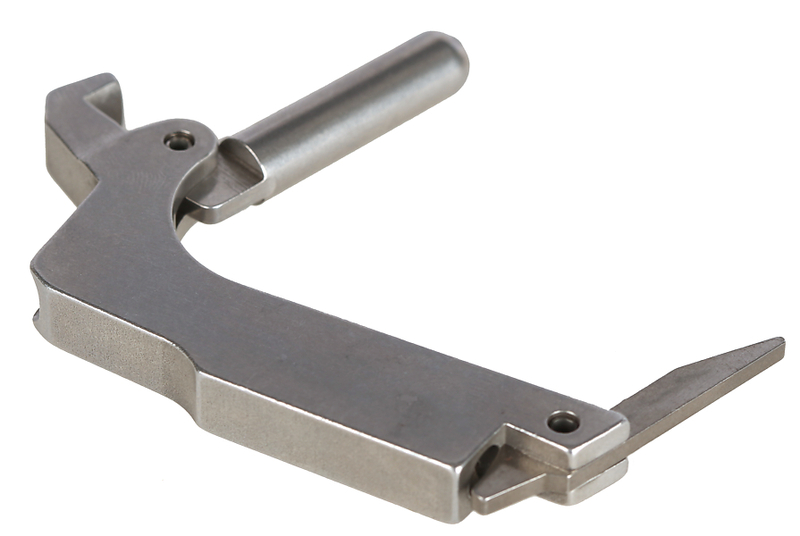 Our mainspring does not feature the lock feature found on the Ruger factory MKIII Mainspring. This sight rib comes with a Target Front Sight installed. It gives a superb sight picture and the sight radius of a 6" barrelled Target Pistol. Simply remove the sights and optics Mount from your Volquartsen LB Pistol, then fit the Masters Sight Rib using the Optics Mount holes and the bolts supplied. Then fit the Rear Sight to the Masters Rib. Although the Masters Rib does incorporate a Weaver Rail, we do not recommend fitting optics. As fitting to an LB Pistol has the Rib floating above the barrel, and not fixed to it. Established in the UK Target Sports, as an accomplished Gallery Rifle and Pistol Competitor. Having represented England and Great Britain. And currently holder of two Gallery Pistol British Records.Specialist Importer of Volquartsen Target Rifles and LB Pistols for the UK Target Sport.